Making the leap from working as a successful business analyst at one of the big four banks to becoming a Loreto Sister was all part of the journey for Janet Palafox. Today Sr. Janet is looking forward to embarking upon a new path in her life from leading a team at Caritas Australia in Perth to accepting a mission in Peru. Following in the footsteps of Loreto Sister Margaret Bourke, Sr. Janet will join the Loreto Province in Peru at the beginning of next year, after responding generously to the calls of the Gospel and the IBVM Institute to ‘go where the need is greatest’. “I will be working among the people who are the poorest of the poor in some ways, but I know I am going to gain and learn a lot from the experience as well,” she said. “I thought I’d seen hardship and the battle for justice before. But the places I have been to as a Loreto Sister, the people I have met, the stories I have shared… have enriched and changed my life forever.” Joining the Loreto Sisters has allowed Sr. Janet to pursue her calling for social justice. Janet Palafox ibvm has over eight years experience in development, justice and welfare. She has recently resigned as the Diocesan Coordinator for Caritas Australia in Perth to accept a mission in Peru with the Loreto Sisters. Prior to that, Janet was working for Centacare Wilcannia-Forbes where she was responsible for building partnerships among rural and remote communities and local organisations to support students (mostly First Australians) to improve their education outcomes. 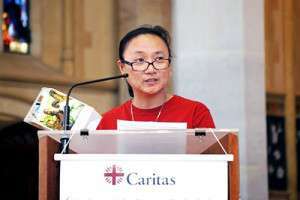 From 2007 – 2012, she was the Executive Officer of Mary Ward International Australia, the justice and development office of the Loreto Sisters. Raising awareness of justice issues, relationship building, fundraising and providing formation to volunteers, staff and supporters have all been part of her work.